The bar for gratuitous pop-up shop gimmickry was set pretty high last year, sometime between Nicola Formichetti’s prism walls and Tommy Hilfiger’s temporary beach house. That makes Odin New York’s new pop-up, a 350 ft² pristine white cube dedicated to its Fragrances and Home Fragrances line, all the more refreshing. Odin teamed with design provocateurs Snarkitecture to create an interior based on the brand’s signature black-on-black bottle. 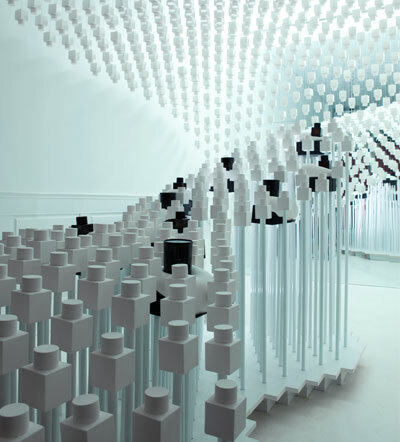 Instead of display cases, the store is filled with two cascading waves of white cement casts of the Odin bottle, one emanating from the floor and one from the ceiling. Just a few real products are scattered among the white clones, instantly visible for their contrasting color but, oddly, almost like negative space instead of the main attraction. It’s certainly a unique way of selling products. Though known as a men’s lifestyle brand, the fragrance collection offers six unisex scents and four candles for the home. The pop-up is open for the next six weeks.